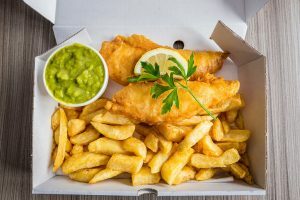 Hewigo is the leading manufacturer of frying ranges for fish and chip shops and take-aways in the UK. Massey Catering Equipment are the leading and Exclusive Supplier of Hewigo Frying Ranges in the North and South of Ireland. Hewigo were one of the first companies to introduce high efficiency burners into our equipment and a programme of constant refinement means that your range will be one of the most technologically advanced available. Choosing the correct fish frying range for your shop is one of the most significant decisions you will make in business life so it is essential to find the right people to help you with this, Massey catering has over 35 years’ experience of working alongside Hewigo and is this relationship is one of the reasons so many choose Massey Catering Equipment as their number 1 choice in the purchase of their Fish Frying Range!! You have the choice of a counter, island or wall range finished to your specific requirements with all the extras you want. All our ranges are individually tailored with the appropriate number of pans required for your outlet. Meeting all European quality standards, your range benefits from Hewigo’s considerable investment in people, materials and the latest technology. Finally, each range comes with a full year parts and labour guarantee and the even greater reassurance of Massey Catering’s 24 hour, 7 days a week service support. A standard Hewigo range is equipped with frying pans, baskets, chip box, display cabinets, motorised extraction systems, mechanical gas thermostat controls and manual bucket filtration. What do you need to know about buying a range? Efficiency – A high efficiency burner working at 93% efficiency means considerable savings in gas, cooking oil and raw material use. Evidence from Hewigo customers’ experience indicates that this saving can be:- 30% on gas consumption: 40% in cooking oil usage: 20% in raw materials. Hewigo’s considerable experience with this technology ensures you have the most advanced products in this category. Hewigo High-Efficiency ranges qualify for Carbon Trust interest-free loans. Filtration – Here the latest Hewigo option is three-stage filtration. In addition to the standard coarse and fine crumb filters, the returning oil is now sucked under pressure through a third micro-filter. The result is a refinement of the oil such that it retains its optimum performance up to three times longer. Control – Sensitive digital control is available and can be combined with touchscreen technology if required for even more sensitive and visible control. It can also be linked to a frying management system to give both information and diagnosis. Design – Looks can be all important. The co-ordination of style and function is a vital aspect of marketing an outlet. 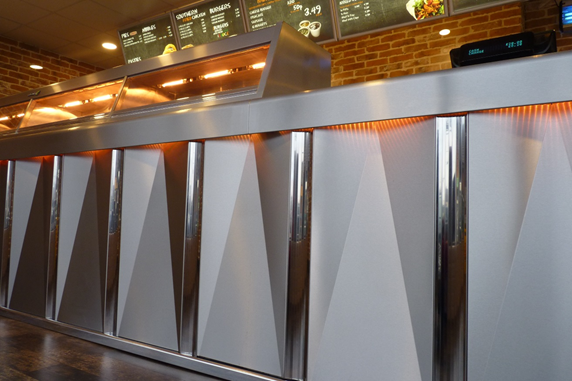 Hewigo ranges can be finished in brushed or polished stainless steel with convex, concave or traditional styled front panels. 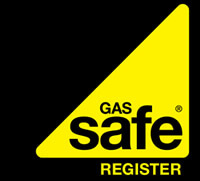 Bespoke or standard graphic logos can be added for effect. Lighting is by fluorescent tube or the now very popular LED which offers endless combinations of colour and lighting sequences and also saves energy. Individually designed and matching cooking, storage and shelving areas can be made together with coordinated salad bars and removable counters. 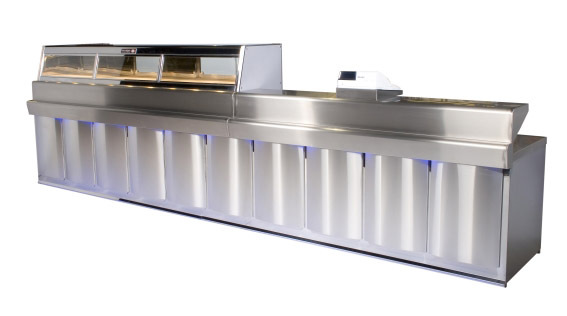 New & Reconditioned Fish Frying Ranges Available – Contact Us For More Information. Like to be slightly Different? 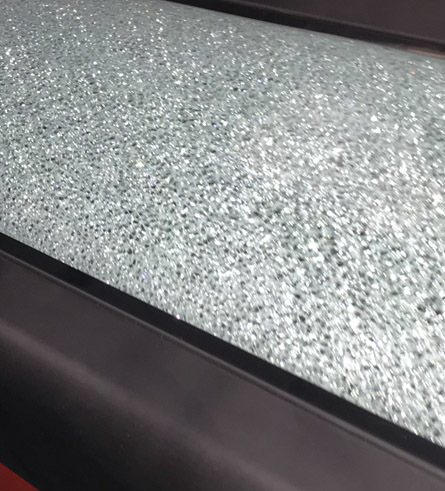 Enquire about our newly launched crushed Glass counter effect! Our helpful and friendly staff are always on hand to take your call.